Contrary to popular opinion, freezer meals are not all cheesy casseroles! 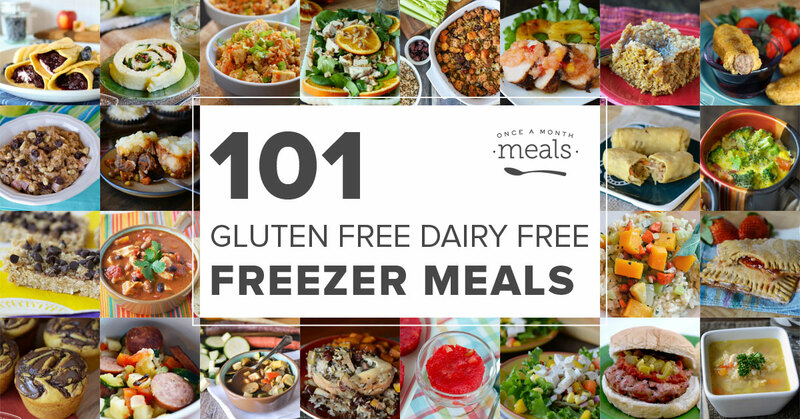 We have 101 Gluten Free Dairy Free freezer meals to create the perfect meal plan. All Gluten Free Dairy Free Recipes! All Gluten Free Dairy Free Menus! This looks great!! Can’t someone please make a copycat recipe of Udi’s frozen chicken alfredo pasta? So glad this post was help to you Tina! And we can certainly pass that recipe recommendation along! Thanks again for the feedback! Are there any gluten free only recipes? I like dairy but can’t eat gluten. We have additional tags to filter recipes by, including a gluten free one that isn’t tied to dairy free, in our Menubuilder database available to members. But on our gluten free dairy free recipes that call for a non-dairy substitute, like cheese or milk, you could always use regular cheese or milk instead. I loved at one recipe, wanting the wraps. It was not there. The filing was described but not the wrap. So I feel your recipes are incomplete. I will probably delete this site. Jacqueline, can you elaborate a little more about what was incomplete? We’d love to be able to resolve your issue! Many thanks! hazelnut spread DOES contain dairy…. You are correct but there are lots of delicious dairy-free hazelnut spread on the market that would be great for this recipe. Enjoy! Do you offer Gluten Free, Dairy Free and Vegetarian freezer meals? Absolutely! We have Gluten Free Dairy Free and Vegetarian Menus and Recipes! You can go to our menus or recipes pages and use the filters on the left side to search. Hi. Love the recipes. Can you use any dairy free cheese to cook with and then freeze. I always liked stuffed peppers with rice and grated cheese but after cooking will the cheese in the rice be OK in the freezer. Hi Nina, Great question. I have passed on your question to our Menu Builder team to see if they have any dairy free cheese suggestions with freezing. We will update you with an answer soon. Thank you for all the menus and recipes! I do wish that fewer of the dairy free recipes called for dairy- free cheese. It is not that good, is expensive, pretty processed, and seems like a less tasty version of what I actually want (real cheese). I do appreciate the effort to have the category, though.